Marie Lloyd at the height of her fame. Marie Lloyd is best remembered today as the doyenne of music hall entertainers. Her command of double-entendre and ability to give a risqué sexual charge to the most innocent of lyrics made her a huge star, not just in her native London, but around the UK and beyond. But the woman who brought the house down with the likes of “I sits among the cabbages and peas…” never abandoned her East End roots, and when music hall performers in the capital went on strike in 1907, Marie Lloyd, star of the Edwardian stage, was there at their side. Until the turn of the century, most music hall entertainers had enjoyed relatively flexible working arrangements with music hall owners. By the Edwardian era, however, terms and conditions were increasingly formal, preventing entertainers from working at other local theatres, for example. 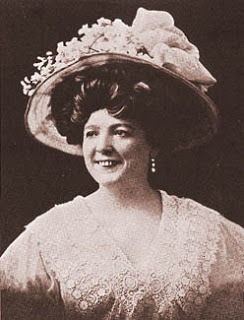 The 1907 dispute began when in addition to the single matinée (afternoon) performance included in most performers’ contracts, music hall owners began to demand additional shows – adding up to four matinées a week to the workload for no extra money in some cases. The Variety Artistes Federation, established the previous year and with a membership of nearly 4,000 performers, was having none of it. On 22 January, performers, musicians and stagehands at the Holborn Empire walked out on strike. The dispute would spread to 22 London variety theatres, and saw 2,000 of the Variety Artistes Federation’s membership on picket lines at one time or another. The dispute was backed by a number of leading performers, including Arthur Roberts, Gus Elen and Marie Lloyd – as well as by the stars of the Edwardian labour movement, among them Ben Tillett and Keir Hardy. For two weeks, the union ran a masterly publicity campaign, distributing leaflets declaring a “music hall war” and hiring the Scala Theatre to put on a fund-raising show. In due course, the dispute was referred to arbitration – the suggestion apparently coming from the author Somerset Maugham – and Sir George Askwith, concilation officer at the Board of Trade, was appointed to try to find a resolution. After 23 formal meetings and numerous less formal ones, the resulting settlement produced a national code, a model contract and a procedure for settling disputes. In effect, the performers won more money, plus a guaranteed minimum wage and maximum working week for musicians. 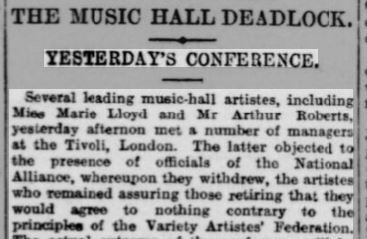 Although the strike ended well, the music hall owners exacted a sour little revenge on Marie Lloyd. Five years later, when the first music hall royal command performance for the music hall was held, vengeful managers excluded the greatest star of the music halls from their line-up.